Ladies wedding band with Norwegian Rosemaling hand engraving with black rhodium finish. 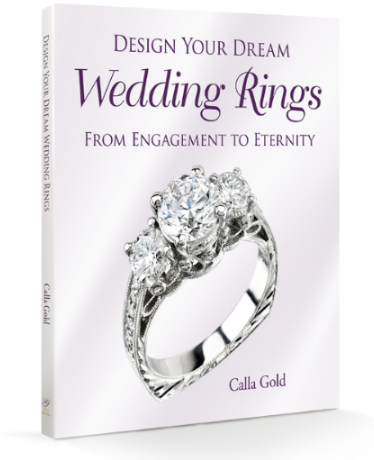 I’ve talked a lot about yellow and white gold engagement rings in other posts. While I’ve touched briefly upon various types of gold, and how they are made, I felt that rose gold deserved its own post. 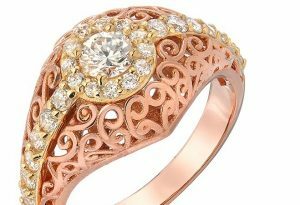 Rose gold has a little secret that impacts how your engagement ring will perform for you. 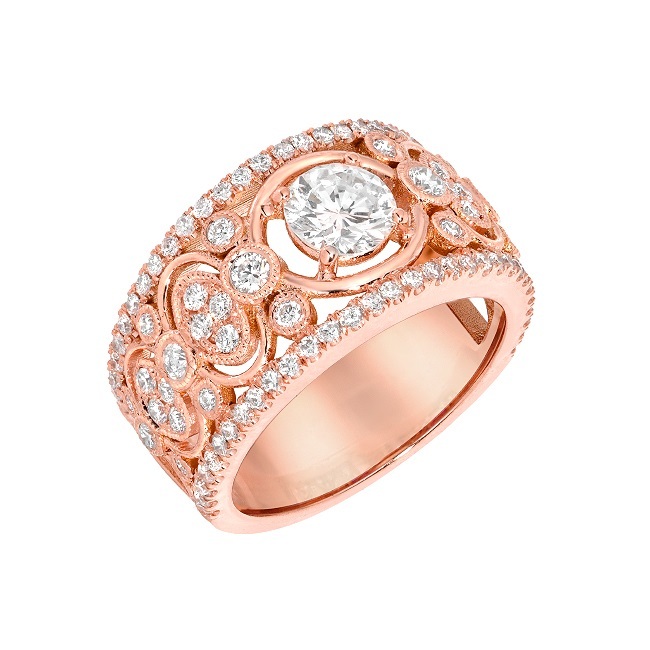 How About Rose Gold For Your Engagement Ring? 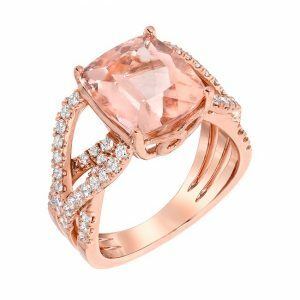 Rose gold is such a beautiful , and popular gold color, it draws many to it as their chosen gold color for their engagement ring. Is it right for you? In this post I’ll let you know about how this gold’s unusual quirks could spell trouble for your engagement ring’s longevity. First I’ll get a little technical. Rose gold is also be known as “red gold” or “pink gold.” This is because the rosey pink color gold is a man-made alloy, “pure” rose gold does not exist in nature. Generally speaking, the rose color is achieved by combining gold with a copper alloy metal mix. Copper’s bold, almost orange-like color allows gold to achieve that nice rosey pink color. The varying percentage of copper used determines the color of the gold. The more copper that is used, the stronger the rose color. 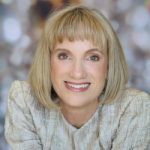 If you’d like to go all technical with me here are possible recipes of alloyed metals used to create your pretty pink gold. The percentages vary depending on who makes it. These percentages are one company’s percentages. 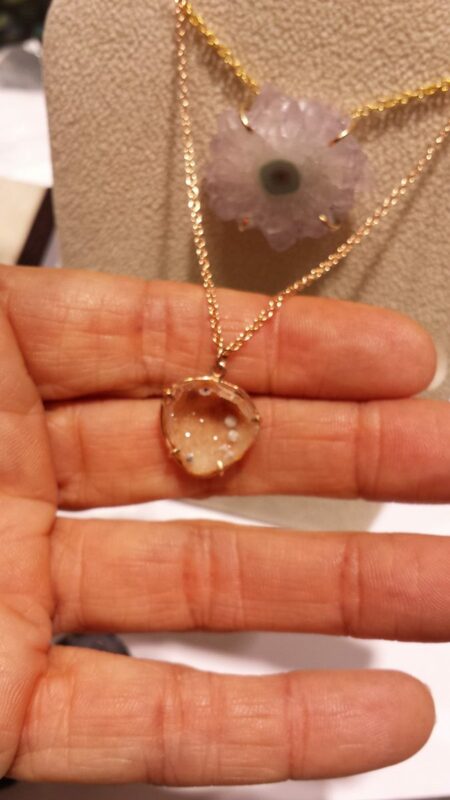 A rose gold chain and pendant. This is a prong set rose quartz crystal. Prongs are great on a pendant which gets little stress from daily wear. 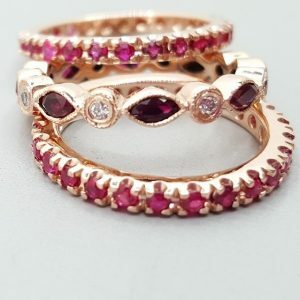 I foresee a rise in the demand for rose color engagement rings based on the fashions and furnishings colors that are coming out. I want people to know about the special needs of rose metal especially from a maintenance standpoint. If you are used to yellow gold and white gold jewelry, you are used to leaning on a certain level of sturdiness. What Could Happen to my Rose Gold Engagement Ring? With Rose’s higher copper content, it is a more difficult metal mix to work with technically, than yellow or white gold. The high copper content makes it susceptible to color changes if it comes into contact with certain chemicals. If abused, which isn’t hard to do, a rose ring can develop a different texture at the area of repair or heat work. Sometimes when soldering is done on a pink gold ring, the area of solder changes color or texture or in the worse case becomes weaker in that area. Why Does Rose Gold Have These Issues? This is a rose and diamond ring I designed to re set a client’s wedding diamond. We went for fun texture and shapes. For strength my client opted for a bezel setting style rather than prongs. Rose gold has to be heat worked more carefully. When your pink gold jewelry needs to be repaired, be sure to go to a jeweler experienced in working on it. Preferably a jeweler who can offer laser welding as an alternative to open flame soldering. Also, know that your rose ring will probably need repair more often than yellow or white gold, due to the fact that it’s alloy composition makes it susceptible to becoming brittle in places. It is also softer than yellow and white gold. Where this makes the most difference is at the point of tiny prongs holding tiny diamonds. In my experience, tiny prongs made in rose gold need more maintenance than do their white gold and yellow gold brothers. Pink gold is more malleable than yellow and white gold. Malleability is movableness. If you hit your ring prong just right, it could move to the side and your tiny diamond could go flying. That’s not something that’d happen with white gold, which is a much harder and less yielding metal mix. Are You Trying to Rain on my Rose Gold Engagement Parade? 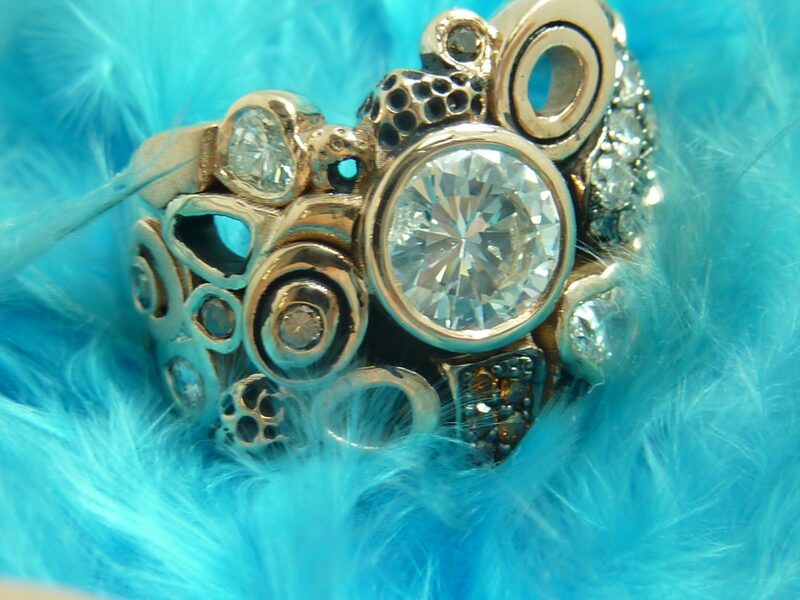 This Ring is Worn on Special Occasions. Not Daily. I’m seriously not trying to rain on your parade. I custom make many rose gold engagement and wedding rings. While I’m designing them I’m letting my client know that if they choose the popular “U” set prong design, that like a fine sports car, their ring will need maintenance more often that same design in yellow or white gold. Don’t get me wrong, I’ve loved the beauty of rose gold for years. I just like people to be informed. And wearing rose gold daily requires a bit more forethought and perhaps design tweaks. You’ll be wearing your ring every day, it will get banged around and loved. I just wanted you to know about rose gold and its little quirks! Is there a difference in color between 14kt and 18kt gold? Is one more rose colored? I have an inherited chain with an oval engraved pendant from my grandmother. It is rose hued, but when I hold it up to today’s rose gold, then it looks more yellow gold. What’s that all about? Hi. How can I get a men’s wedding band made like the Ladies wedding band with Norwegian Rosemaling hand engraving with black rhodium finish? And how much would it cost? I have the same question as Bryan above. I’d love to get one like this for my fiancé. 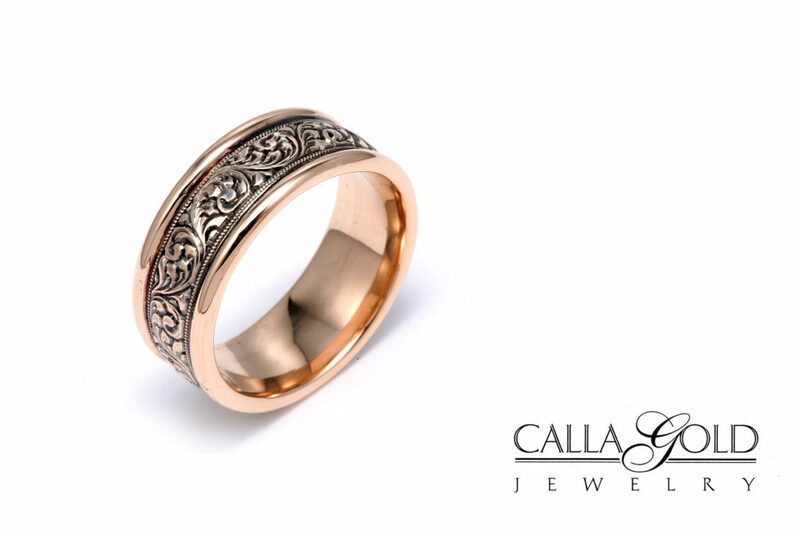 I love rose gold and thought of having it for a wedding ring. In fact a very unusual wedding ring. 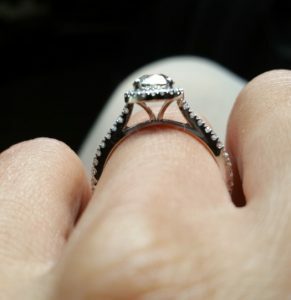 It is two rings, one on top of the other with diamonds along the edge (6 in total on each edge I think) but obviously they need to be soldered in place to keep the two rings in place. Is it a bad idea to have something like this seen as it will be worn every day? Hi! I just had my rosegold engagement ring 3 days ago i frequently spray alcohol on my hands and it turned the inside of my ring to yellow any remedies?